We are proud to say our Grand Opening was a hit! We couldn't have done it without such an awesome community of locals. Thank you from the bottom of our hearts to our vendors, entertainment, employees, volunteers, and visitors. A special shoutout to Tahoe Chamber, Verde Mexican Rotisserie, Pretty Odd Wieners, Chimayo Street Grill, Brothers Bar and Grill, Sweet Spokes Pops, Ike & Martin, Bison Bluegrass Band, KRLT, Lake Tahoe Fire Dancers, TAMBA, Lake Tahoe Bicycle Coalition, and Coachman Hotel! Our first day kicked off the Grand Opening with a ribbon cutting ceremony thanks to Tahoe Chamber! South Lake Brewing Company has been a dream turned to reality spanning over 5 years. The ribbon cutting ceremony, therefore, was more CELEBRATION than ceremony! The remainder of the day was spent drinking SLBC brews, eating delicious food thanks to Verde and Pretty Odd Wieners, and dancing/singing to Ike & Martin's lively tunes. 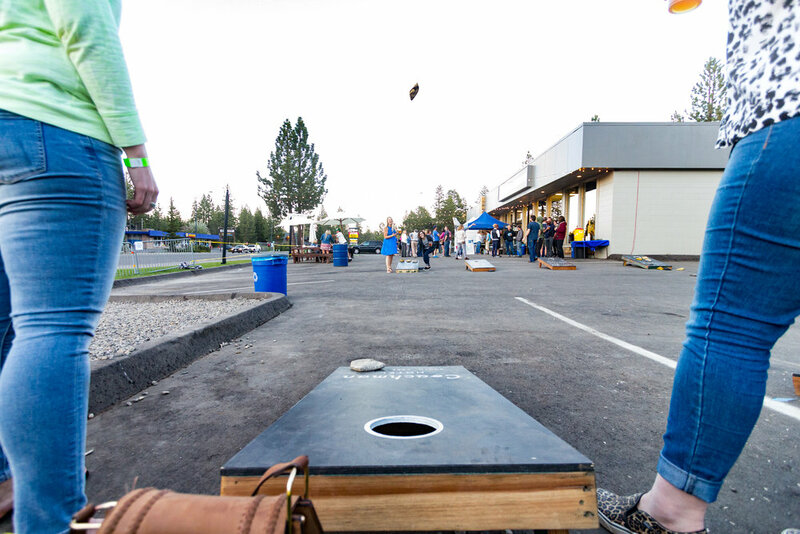 Saturday continued the celebration with a corn hole tournament sponsored by Coachman Hotel, BBQ by Brothers Bar and Grill, and Tacos from Chimayo, more SLBC brews of course, foot-tapping tunes by Bison Bluegrass Band, and a breathtaking performance thanks to the Tahoe Fire Dancers. Sunday ended our celebration Funday-Style with beer and boardgames! Not only did we have great food to pair with our brews, the entertainment was on point, and we saw smiles for miles. We had so much fun and hope you did too. It's safe to say our Grand Opening kicked off the summer season just right!